The unique pivot arm design of the Poolpod allows the platform to deploy in a single motion. It takes approximately 20 seconds to lower to a 0.9m depth. The lift remains level during its deployment phase and when stowed remains clear of the pool. Touch sensors ensure the safety of other pool users. The unique pivot arm design of the Poolpod allows the platform to deploy in a single motion. It takes approximately 20 seconds to lower to a 0.9m depth. The lift remains level during its deployment phase and when stowed remains clear of the pool. Touch sensors ensure the safety of other pool users. The use of the secure proximity wristbands allows multiple users, monitoring and safe use of Poolpod. Poolpod can be easily removed from the poolside and stowed remotely for events by pool staff. 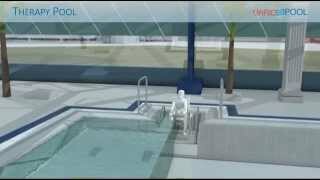 The complete Poolpod system includes a pool attendants’ remote control, a wall charging unit and changing room security for wheelchairs.